A striking Taj Mahal scenery wall mural surrounded by luscious leaves, aloe and trees this unique wallpaper mural design will create instant impact in your home. 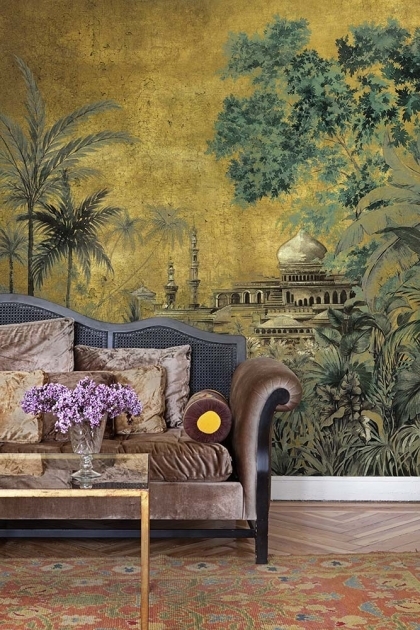 A stunning golden wall mural the dramatic green jungle scene shelters the Indian Palace in a gently watercolour style. An incredibly beautiful digital print wallpaper mural, the Chinoiserie mural measures 2.8m in height x 4m in width and is printed onto non-woven back paper. Please note, this wall mural has a 2-3 week delivery time. Wall murals are the perfect alternative to traditional wall art, supersizing and creating greater impact than a simple art canvas ever could. An easy and incredibly impactful way to create drama, imagination and wow-factor in the home, we think that anyone who is looking to make a bold statement in the home should invest in a wall mural. 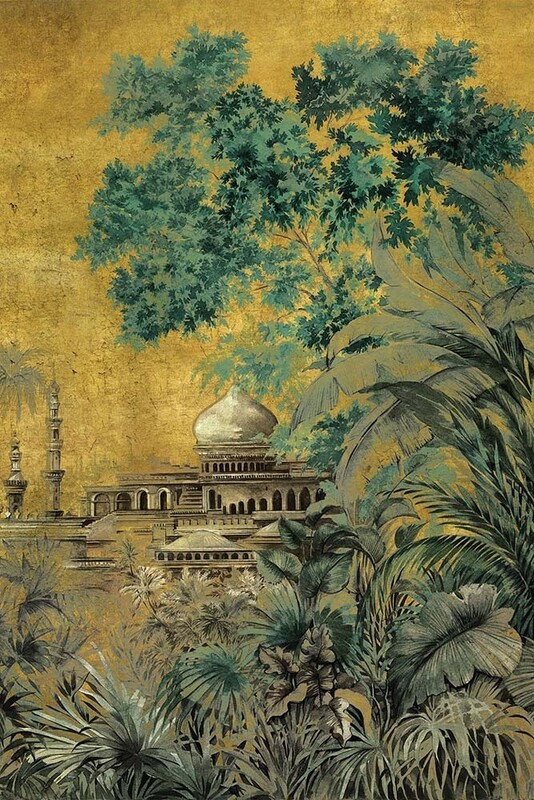 But, the reason why we think that you will particularly love this Chinoiserie wallpaper is because of the sense of tradition, history and elegance it will bring into your home. Traditional style wallpapers like this ground modern looks and help to inject a timeless quality into your interior design. Wall murals like this ought not to be hidden away. The aim of the game is to create impact, so hang this jungle scene wallpaper mural centre stage, such as behind your sofa in your living room, in the entrance hall or in your bedroom. You could even be a little unexpected and hang this elegant East Asian style wall mural in your kitchen for a super bold and eclectic look.